US equity indexes continue to battle upward, with ongoing net October gains of 6.0% (Trans), 4.9% (Dow, Sp'500), to 4.5% (Nasdaq comp'). 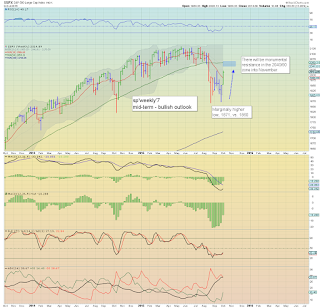 Near term outlook offers continued upside to the sp'2040/60 zone. 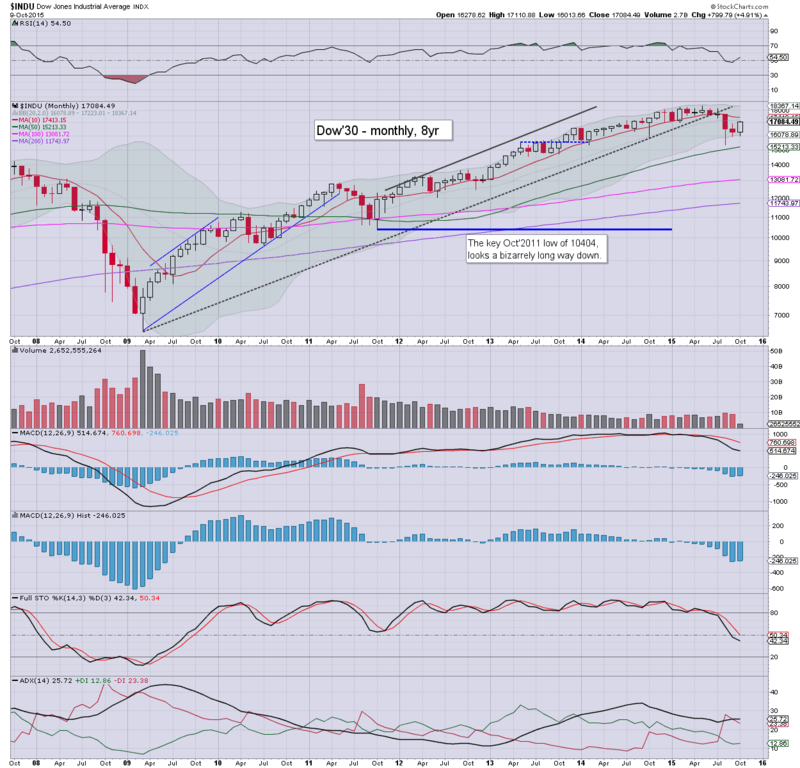 The key issue is whether the market can achieve a monthly close back above old broken support. 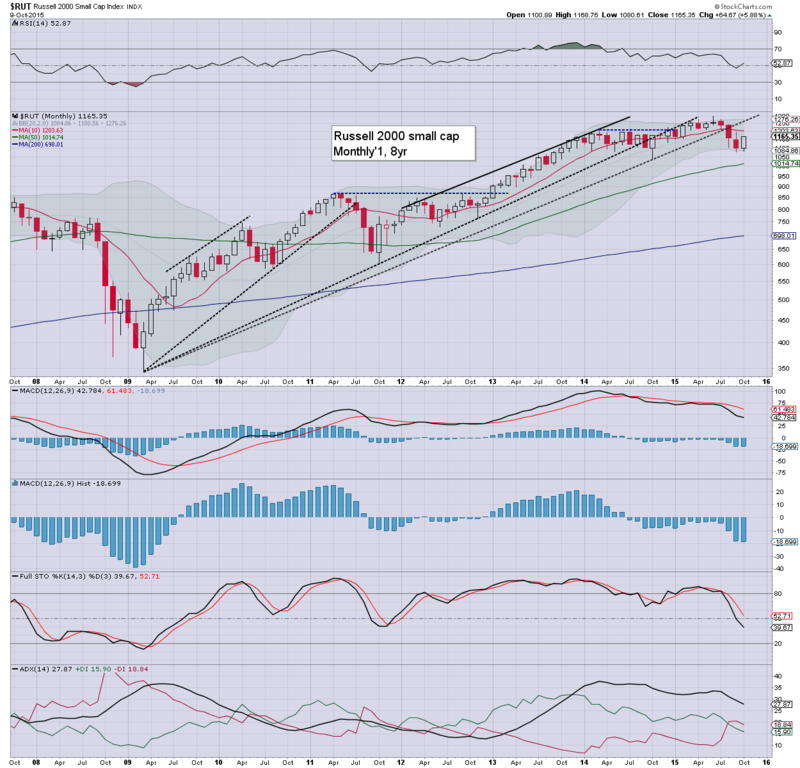 The August break remains a major problem for the equity bull maniacs, with the sp' still under the key monthly 10MA - currently @ 2043. Underlying MACD (blue bar histogram) cycle is starting to tick upward.. but remains deeply negative. 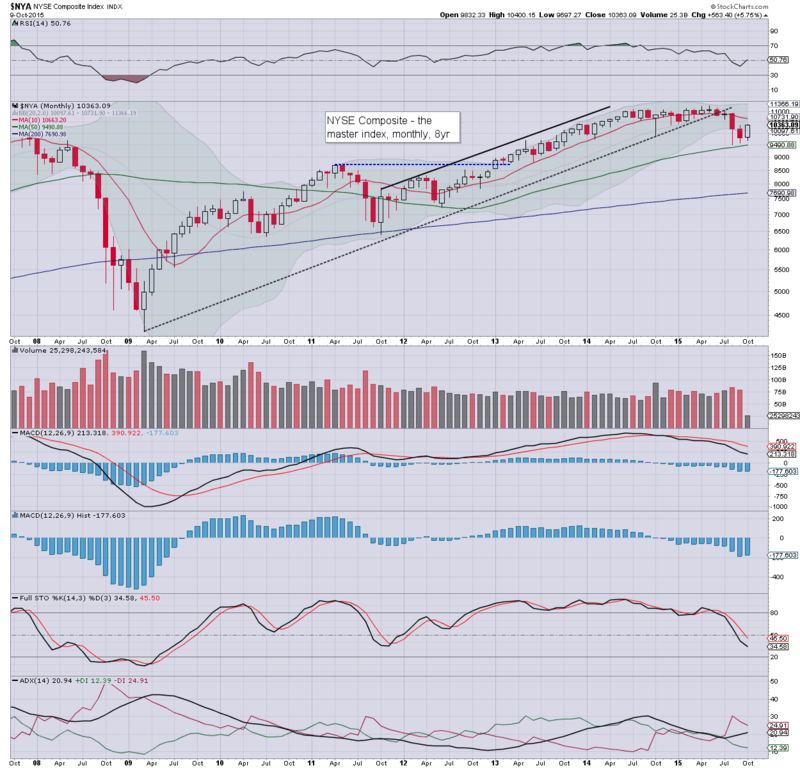 If the sp'500 can't break/hold the 10MA.. with a monthly close (whether Oct, Nov.. or a little beyond).. there will be very high risk of renewed downside. First target would be the Aug' low of 1867... but more so.. the 1750/25 zone. In terms of upside... on a monthly close >2050, first target would be the May high of 2134... and then 2150/2200 zone.. with 2300/500 zone by late spring 2016. Considering the style of price action in August (with VIX hitting 53)... new highs still look difficult. The tech is lagging the broader market, but is so far higher by 4.5%, back in the 4800s. Any sustained action back above the giant 5K threshold would give powerful credence to the notion that the August low of 4292 was a key low. 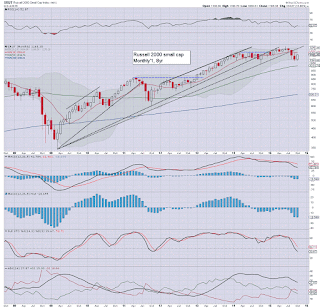 It is notable that despite the current net monthly gain, the underlying MACD cycle continues to tick lower. The mighty Dow is so far higher by 799pts @ 17084. 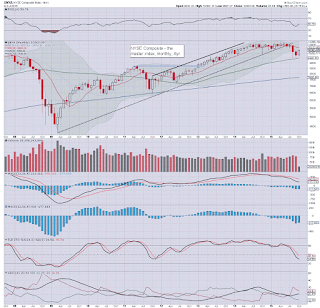 The 10MA is 17413... and if any sustained action >17500.. then the bears should probably drop any further hope of new lows before year end. 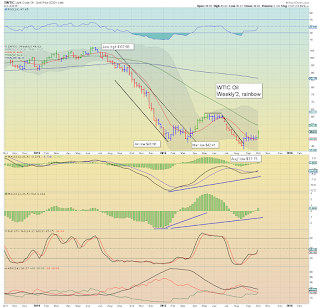 Underlying MACD cycle is starting to tick higher. The master index is currently net higher for Oct' by 5.7% in the 10300s. There is key resistance in the 10600s. 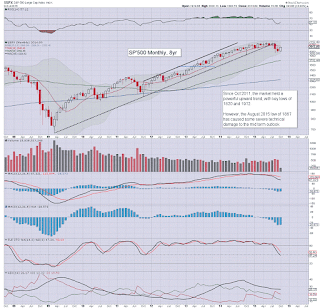 Any monthly close > 10800 would clarify that the down cycle from the May high is likely complete. 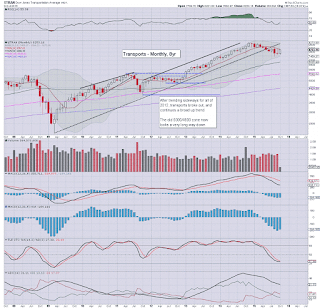 The second market leader is making a strong play to re-take the 1200 threshold, where the 10Ma is lurking @ 1203. Indeed, any Oct/Nov close much above 1225 should clarify the bulls are back in full control. If however the market FAILS, first downside target will be the Oct' 2014 low of 1040... and if that goes.. then 900/850 - which would likely equate to sp'1600/1550. For now though.. the latter levels look extremely difficult. 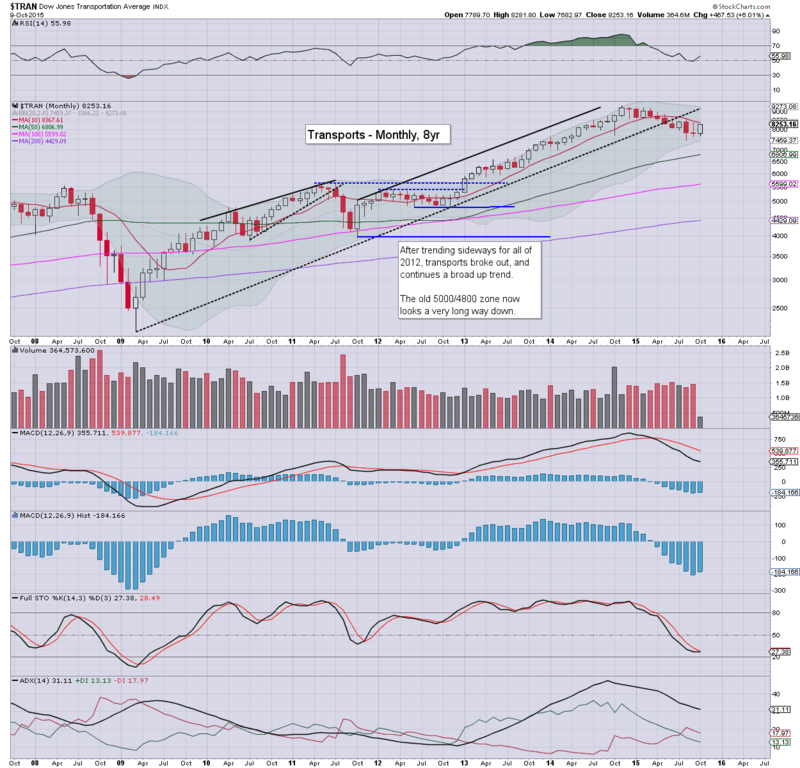 The 'old leader' - Trans, is leading the way higher, and is so far +6.0% for the month, back in the 8200s. 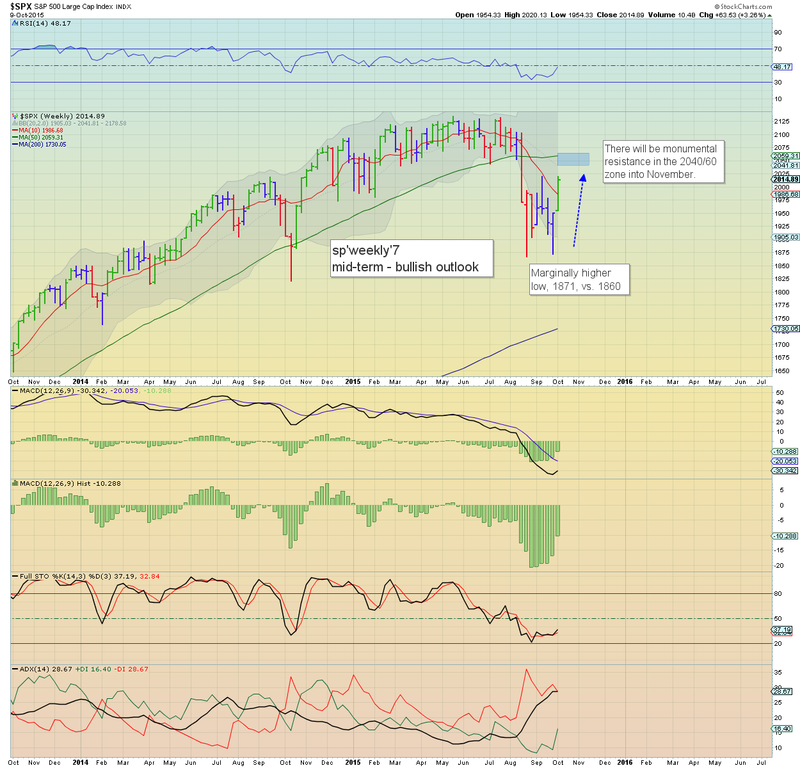 First resistance is the 10MA in the 8300s. Any sustained action much above 8500 (where the 200dma is lurking) will clarify that the more bearish outlook is off the menu. On any market failure to keep pushing higher, first downside target will be the psy' level of 7000. All US equity indexes are currently powerfully higher for October, with daily/weekly cycles offering further upside across the next week or two. Frankly, the more bearish equity scenario is looking increasingly unlikely.. not least as seasonal factors will be working against the bears into early next year. Best guess? A failure.. but... on any sustained trading above sp'2050/60... it'll be time for the bears to wave the white flag for the next six months or so. Aside from corp' earnings, here isn't too much of significance scheduled next week. M - *Columbus day holiday in USA, but markets ARE open. *there are a fair number of Fed officials appearing across the week.. but no Yellen. 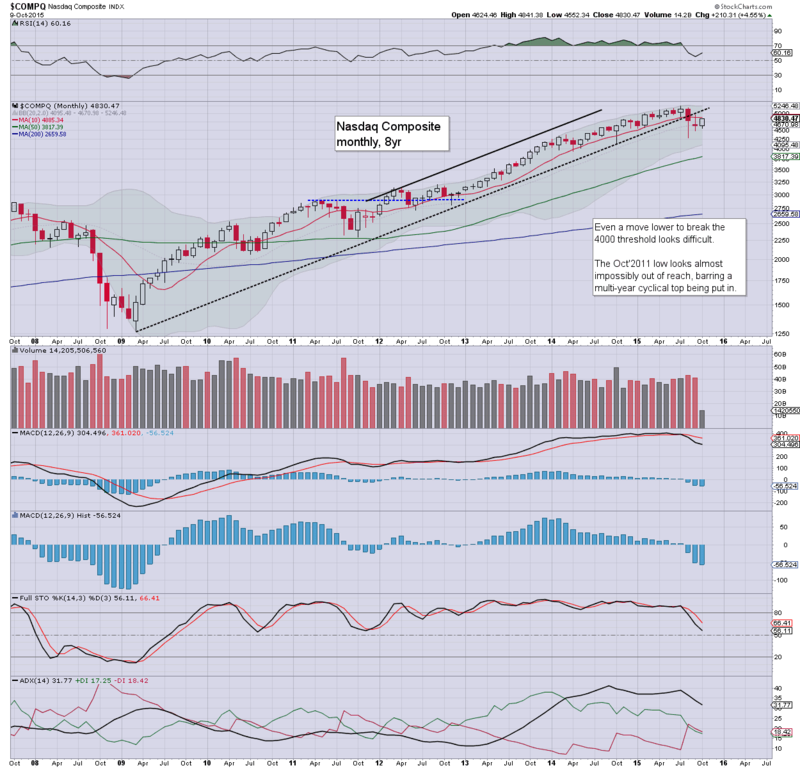 Without question, it was a week for the equity and commodity bull maniacs, with very powerful gains all over the place. 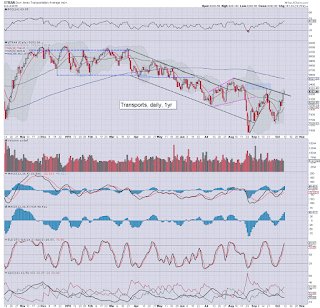 The sp'500 settled +63pts (3.3%) @ 2014 (intra week high 2020), whilst WTIC Oil +$3.97 (8.7%) @ $49.63 (intra high 50.92). 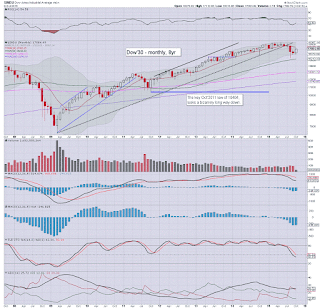 Very notable outright bullish green candles on the sp'500 and WTIC Oil weekly 'rainbow' charts. 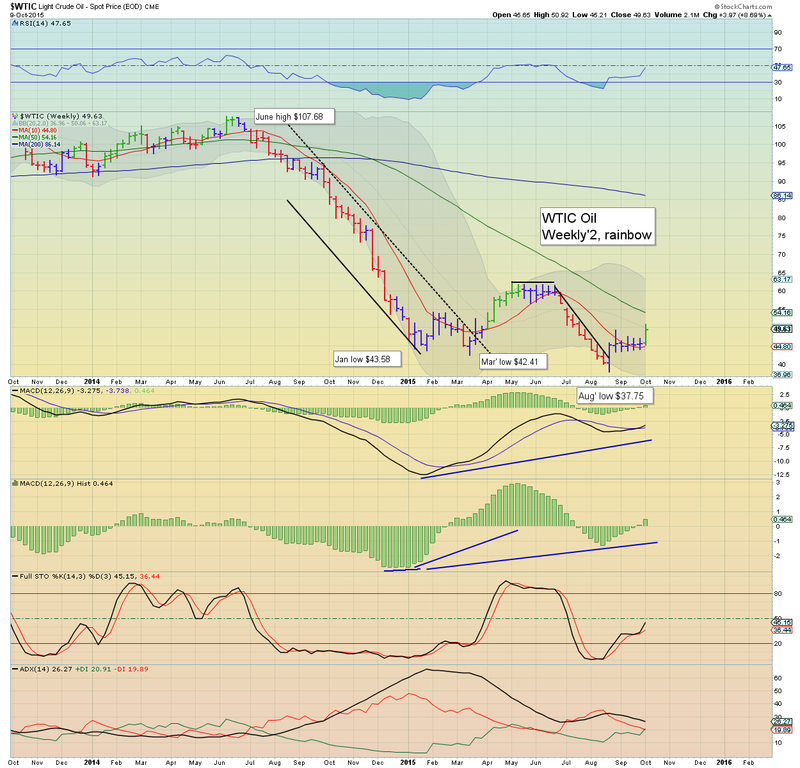 The near term outlook is bullish for equities and Oil. .. and that will suffice for this week.. 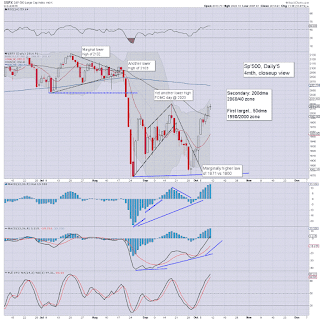 US equities closed moderately higher, sp +1pt @ 2014 (intra high 2020). The two leaders - Trans/R2K, settled higher by 0.7% and 0.2% respectively. 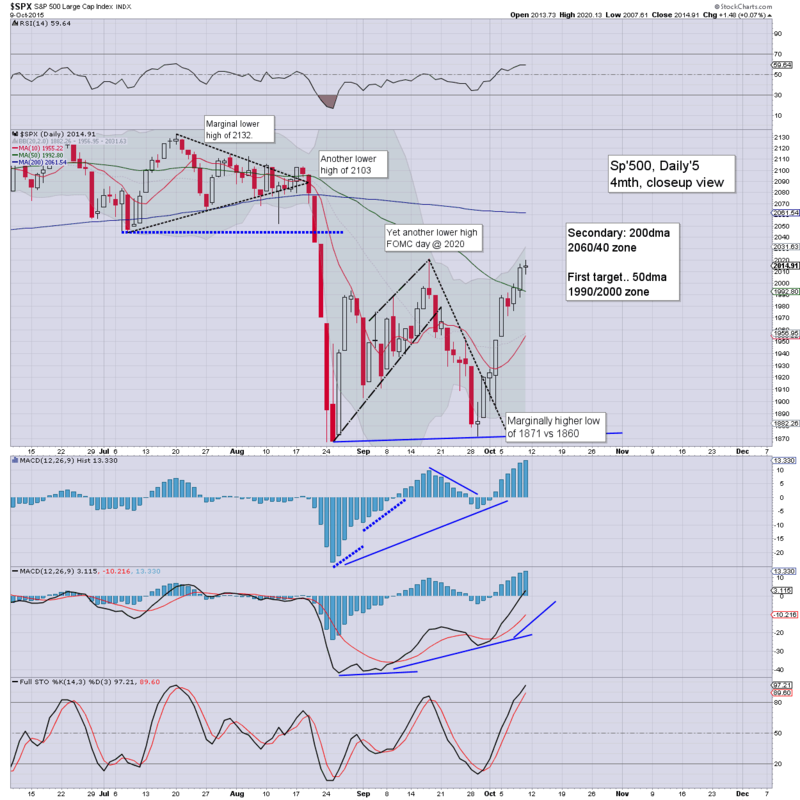 Near term outlook is for continued upside to the 2040/60 zone. 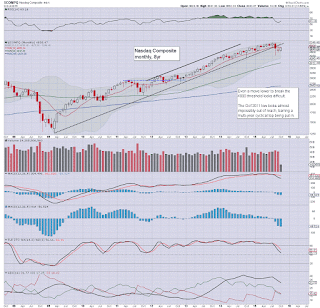 The ultimate issue remains, can the market achieve a monthly close back above old broken support? 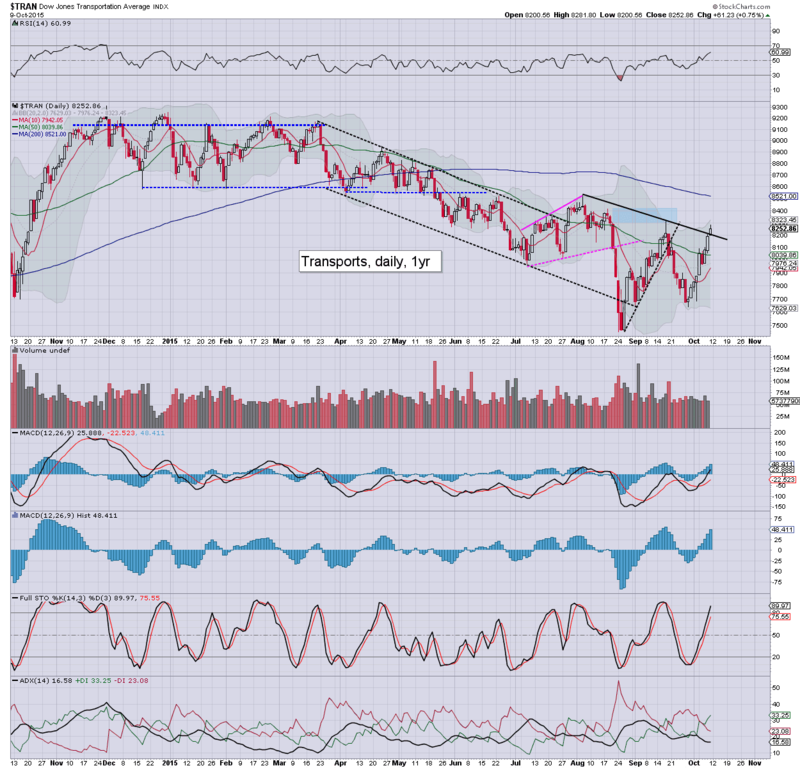 Suffice to note.. a clear break above declining resistance/trend for the 'old leader' - Transports, seemingly headed for the 200dma in the 8500s. 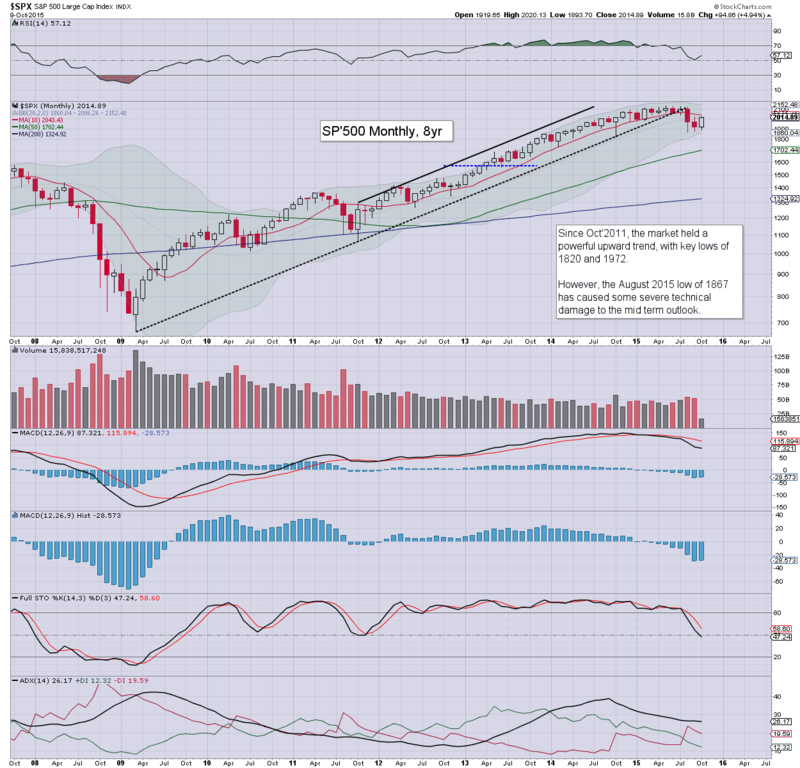 The sp' looks on track for a similar test of the 200dma in the 2060s.